COPPERAS COVE TX (March 29, 2019)— Tracking animals, recognizing poisonous plants, identifying different types of trees, flowers and grasses…these are just a few things that Copperas Cove Junior High students enrolled in Outdoor Adventures, an alternative physical education class approved by the Texas Education Agency this year, are learning. Students are honing their skills in outdoor survival techniques including land navigation, first aid, CPR, water and campfire safety, hunting and camping safety and how to use parachute cord for a variety of needs in the wilderness. Eighth grader Even Sane says Outdoor Adventures is his favorite class. A Copperas Cove Education Foundation grant allowed the purchase a 9-person tent, greenhouse, fishing supplies, and a fire pit as part of the outdoor curriculum, teacher Robin Miller said. 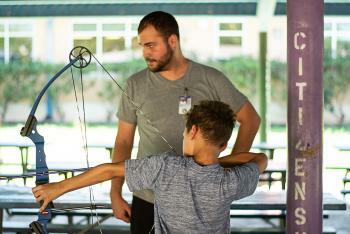 The Outdoor Adventures is often identified by the archery lessons that are included in the class. Students increase their math and science skills learning about velocity, distance, force and more. Although Outdoor Adventures is in its first year at the junior high, Miller and fellow teacher Trevor Allen have fielded an archery team which began competing this month. Sixth grader Piper Mowrey had archery experience before enrolling in the class. “I love shooting archery with bows. I shot before in Girl Scouts and loved it. So, I was excited there was a class where I could shoot,” Mowrey said. The education foundation grant will also allow for students to learn how produce gets from the farm to the table with the purchase of a greenhouse.